It’s another game day in Tuscaloosa! Each week, the closer I get to Saturday, the more nervous I get. We are a dedicated football town and as the season has played out, it seems we have a pretty good team this year. Those who keep up with me know that life stops for Alabama football on Saturdays. And it’s not just the watching and winning. It’s the traditions, new and old, that make Alabama special to me. My traditions include game day menus, wearing the lucky shirt all year, getting Sassy all washed and cleaned and decked out in auto magnets, flags, and tags. Fridays are almost as much fun as Saturdays. Everyone making plans, getting together, or staying home and enjoying a good meal during halftime. 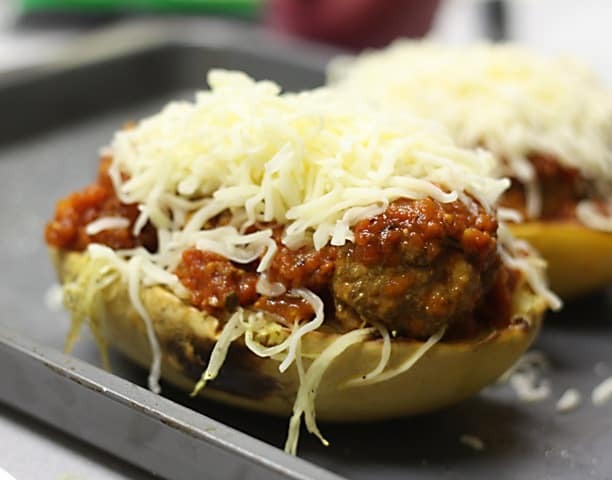 This meal idea came from Kristin at Iowa Girl Eats. I was looking for something to do with spaghetti squash. I needed it to be gluten-free, but not taste like blah. This was perfect! I did this in the oven instead of the slow cooker and it worked out great. I rolled my meatballs, seasoned with fresh herbs and cheese and let them sit while I tackled the squash. Spaghetti squash is interesting. That’s code for not on the superstar list, but not banished to the dungeon, either. It isn’t great by itself and if you’ve never had it, well, don’t expect it to taste or feel like real spaghetti. It’s more like a wet pom-pom. 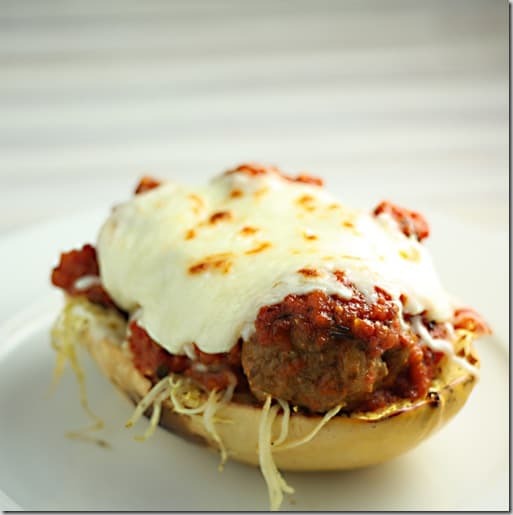 In order to get as far away as possible from that reminder, it helps to add a lot of flavor and gooey cheese. 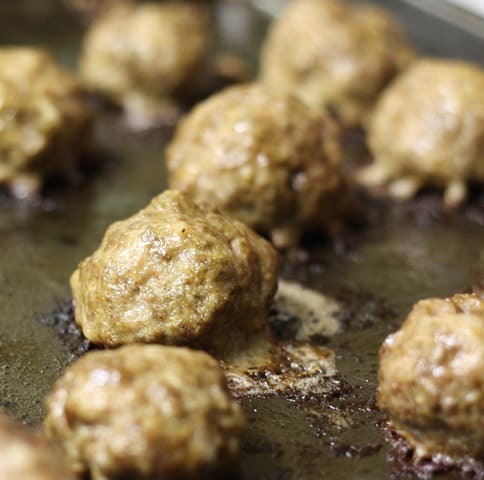 And both the squash and meatballs went into a 425* pre-heated oven. I used some fresh pasta sauce that I preserved this summer from the garden tomatoes and herbs. A little red wine to give it some oomph. After the cheese melts, it’s in your best interest to eat immediately. You definitely want to enjoy the cheese with every bite! Meatballs: 1 lb of lean ground beef or ground round. Mix with 1 egg, 1/2 cup shredded parmesan cheese, 1 Tablespoon Italian herbs such as rosemary, thyme, basil. Preheat oven to 425 degrees. Pierce the center of the spaghetti squash several times on all sides with a small, sharp knife then microwave for 3 minutes, flipping once. Cut spaghetti squash in half lengthwise with a very sharp knife, then remove seeds with a spoon. Lay halves cut side up on a foil-lined, non-stick sprayed baking sheet then brush with oil and season liberally with salt & pepper. 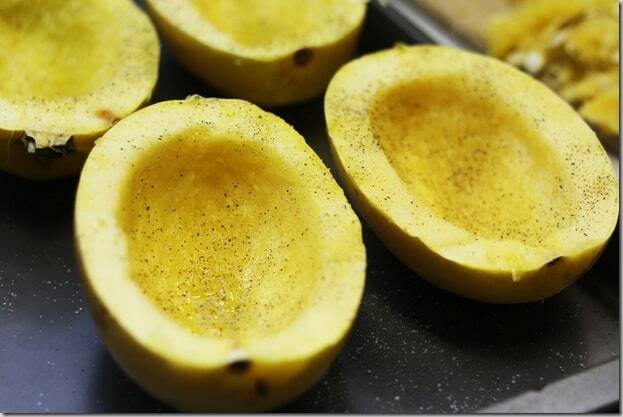 Roast for 50-60 minutes, or until a knife inserted into the thickest part of the squash meets no resistance. Let cool for 10 minutes. This looks so yummy! 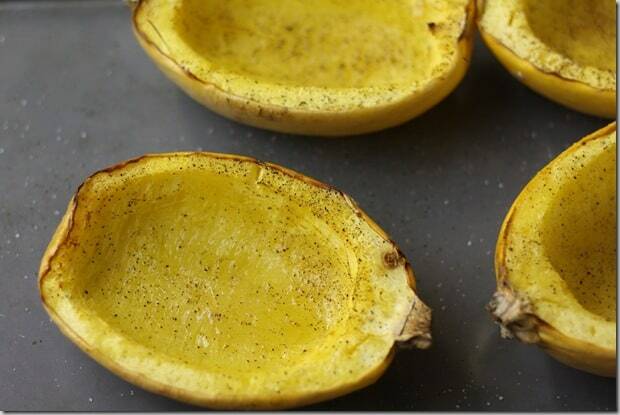 I’ve been obsessed with acorn squash lately, but after looking at these photos, I’m definitely going to have to branch out and buy some spaghetti squash soon!